Railpictures.ca - Michael Berry Photo: A transfer led by CN 7226 is sitting at the western end of Port of Montreal trackage, where it becomes the CN Wharf Spur. It cannot leave until security is in place to flag the many crossings in this area, but soon new crossing gates (an unfinished one is seen here) will render the flagging unnecessary. | Railpictures.ca – Canadian Railway Photography – photographie ferroviaire Canadienne. 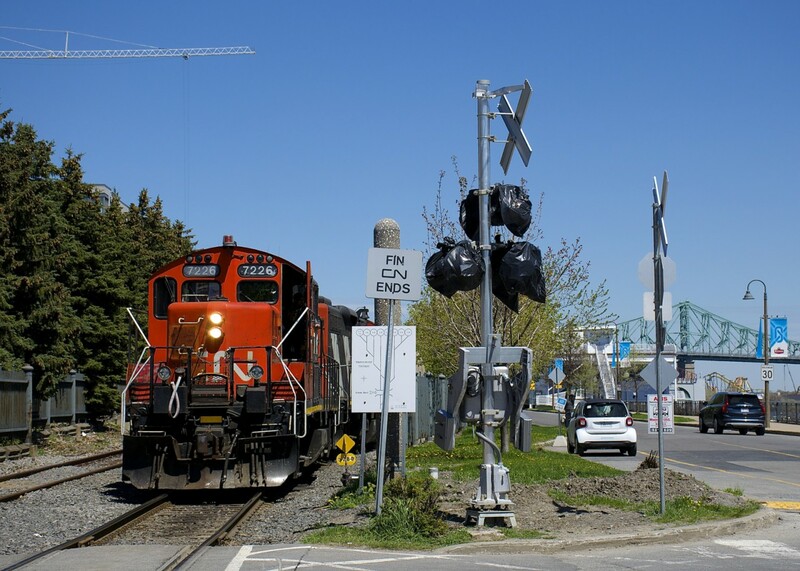 Caption: A transfer led by CN 7226 is sitting at the western end of Port of Montreal trackage, where it becomes the CN Wharf Spur. It cannot leave until security is in place to flag the many crossings in this area, but soon new crossing gates (an unfinished one is seen here) will render the flagging unnecessary. Unexpectedly this major railroad has ended. Signals are in the process of being dismantled and covered. Crews have abandoned their engines in disgust and left the doors open. Stay tuned. More on this story at eleven. I hope you don’t mind Michael, couldn’t resist with the sign.